I AM WITH ONE PERCENT REALTY LTD. NOW, SO YOU CAN GET THE SAME FULL LISTING SERVICE FOR SUBSTANTIALLY LESS. CONTACT ME AND SAVE MEGABUCKS. Having a strong engineering and economic background, I was involved in foreign economic relations over a long period of time. Broad experience along with in-depth analytical, research and organizational skills helped me successfully run corporate businesses in the area of consulting and wholesale supply of construction materials to the Canadian market. In addition, I had a great opportunity to expand my professional mind by occupying a senior position in one of the construction companies in the GTA. I know how construction industry operates, how houses are built and what materials are used. The best practices, arising from my personal investing in real estate in both, the States and Canada, will also benefit my clients and surely be an invaluable asset. Based on my experience and extensive knowledge, particularly in financial, investment, legal and taxation areas (meanwhile clients are strongly recommended to obtain an expert advice), I am in a position to serve both Sellers and Buyers in the best possible manner. Clients will receive an exceptional professional service, coupled with marketing information, analysis and valuable tips. Furthermore, real estate Investors will receive additional information with an emphasis on essential components to real estate investing and its fundamentals, investment analysis, as well as various issues such as joint-venture secrets and ownership structures, best practices related to either income properties or new construction/renovation projects, etc. The above statements are not empty promises that some REALTORS® make nowadays, having little or limited knowledge in various real estate aspects. A genuine REALTORS®’ service is not just about routine activities, associated with handling documents, showings and open house events, but entails much more than that to make the real difference. Integrated approach and extensive knowledge do matter! My clients fully appreciate it. Strictly speaking, poor or very limited REALTORS®’ service that I had encountered at various times, trying to find appropriate investment properties was a compelling reason to get the real estate license for myself. And that really worked for me and my clients. I am sure that clients deserve to get exceptional real estate service and not get ripped off. *For Homes Over $700,000 It’s 1% + $950 Total. Half of this 1% commission is going to Co-Op Brokerage. $3,500 of that $7,950 flat fee goes to Co-Operating brokerage representing the Buyer. We Don’t Charge Any Fees Upfront! The system is based on the internet and MLS. Most Serious/Motivated buyers are on public MLS all day looking at homes, and contact their agent to book a showing or put in an offer. At the same time REALTORS® are required by law to inform their clients of all matching Listings. This is how properties are sold and sold successfully. Just look at One Percent Realty’s track record! Will Other Agents Show Your Home? It’s a matter of great concern for Sellers and the simple answer is YES. Our MLS® listings are shown, and sold, by lots of Cooperating REALTORS® all of the time. Logic would dictate that if our system was unable to attract Cooperating REALTORS® to sell our MLS® listings then we would be selling most of our own listings to our own Buyers. In fact, it’s quite the opposite. 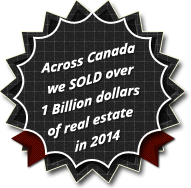 In Ontario offices in 2011/14, 85-90% of our listing sales were sold by Cooperating REALTORS® representing the Buyer. That is the proof that our system works great. The remainder is sold by our own buyers and “walk-ins” from open houses. This is roughly in line with Industry Standards! Don’t be silly listening to conventional REALTORS®’ horror stories about One Percent Realty. It is not true. Call me and get the real facts. 1% CASHBACK DEAL*. All Purchases are qualified! I offer the REBATE in the amount of 1% of final purchase price to Buyers purchasing a property with me. If for example you buy a $600,000 home with me, you’ll get a $6,000 cheque mailed to you directly by my Brokerage (One Percent Realty) immediately after closing. That’s the FIRM and WRITTEN GUARANTEE. Some Conditions Apply*. Can't Be Combined With any Other Offer. Only New Clients are eligible. * This rebate offer is not intended to breach any existing buyer representative agreement and is only paid directly from Eugene Vydria as Salesperson and not other licensees in One Percent Realty Ltd. This rebate offer is conditional on the successful Completion of the Sale, and all commission funds for the sale being received by One Percent Realty Ltd and the Commission being paid to the Salesperson after Completion of the Sale. (note: it typically takes a few weeks or more after Completion of the Sale for the commission funds to be released). The Commission must be at least 2.5% or more for the full amount Rebate (1%) to apply, otherwise, the Rebate will be reduced for the amount equal to a cutback in the Commission (e.g. If 2% co-op brokerage commission is on the listing - the rebate will be 0.5%, in the event that the Commission being offered to co-op brokerages is 1.5% or less - no rebate will apply. The rebate also does not apply to any properties listed for sale by One Percent Realty Ltd. Buyer acknowledges being advised that he/she is to disclose the rebate to any mortgage lender. The Salesperson is personally & solely responsible to pay the rebate and to remit HST on any rebate funds. The Buyer warrants that they must not have been introduced to any property, where the rebate is to apply, by anyone other than the Buyer themselves or One Percent Realty Ltd. nor has the Buyer viewed the property with any agent other than One Percent Realty Ltd’s agent(s) nor is the Buyer currently under contract with another Brokerage in a Buyers Representation Agreement. This is to avoid any possible commission disputes and related non-payment of rebate if a commission dispute is lodged against One Percent Realty Ltd in conjunction with the Buyers purchase. If there is a commission dispute, any rebate will be recalculated based on the commission retained until after the resolution of such a dispute and relation between a cutback in the Commission and size of the Rebate that is established by this Disclaimer. The resolution of a dispute shall be at the sole discretion of One Percent Realty Ltd. This Offer ends on January 01st 2019 but may be withdrawn at any time by the REALTOR® at his sole discretion. As it was noted in the Preamble clients investing in real estate will be specially treated based on their specifics and requirements. You will get tons of invaluable information, tips and hidden gems. At the same time, all services designed for regular clients will be made. I’ll help Landlords in listing their properties also searching the best prospects. Tenants will be properly served to get the most appropriate lease. Terms and conditions are quite standard for this market. Free No Obligation Evaluation of Your Property. THE REALTOR® at ONE PERCENT REALTY LTD.